Jesse Martin fits a lot of descriptions as a poker player – a consummate professional, a successful high stakes cash game grinder, and now a World Series of Poker bracelet winner. Martin dominated one of the most accomplished final tables of the 2013 WSOP in one of the most difficult games in poker to earn his first bracelet and $253,524. He defeated David Baker, who was at his fourth final table of the 2013 WSOP and won this very event in 2010, heads-up to seal the victory. He fought back tears as he struggled to take it all in, the bracelet coming far quicker and easier than he expected after busting Baker and Konstantin Puchkov in rapid succession after returning from the dinner break. 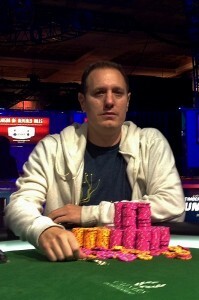 It was redemption for Martin, who made two deep runs earlier this summer at the WSOP only to finish tenth both times. It made Martin’s victory even sweeter when it finally happened. After dispatching Puchkov in third place, Martin was set to dig in for quite a fight with Baker. He took a five-to-one lead going into the heads-up match, but had some cause for concern as Baker took the first four pots. They traded pots for four more hands, and then the final hand of the tournament developed very quickly. Martin raised to 62,000 on the button and Baker three-bet all in for 447,000. Martin called, and both players elected to draw one card. Martin had the better draw with 8 7 3 2 against Baker’s 9 6 5 2 . Baker suggested they change it up. “Lets do something fun,” he suggested, and Martin agreed to flip his card over at the exact same time. Martin tabled the T to make a ten-eight low, while Baker drew a disappointing K , bringing the tournament to a close. The early stages of the final table played out quite differently. John Hennigan lost an early pot to Jesse Martin, putting him among the shortest stacks at the table. Hennigan took down the blinds and antes several times, but also got pushed back with a few three-bets to all but neutralize those pots. After Puchkov opened to 24,000, Hennigan three-bet all in for about 150,000 and Puchkov quickly called. Hennigan was first to act and stood pat, and Puchkov was pat behind him. With his tournament on the line Hennigan tabled a ten-eight low, but Puchkov had 9-8-7-5-4, eliminating the two-time bracelet winner in seventh place. Jon Turner was the short stack when Hennigan was eliminated, but a lot would change in the four-and-a-half hours of six-handed play. He’d double up twice and triple up once to stay alive, but even Turner could not compare to the ride that Jesse Martin was on. He started in second, quickly fell to the short stack, and he was at risk for his tournament life with a draw to 8 6 5 4 against Jeff Lisandro’s made J 7 5 4 2 . Martin hit a 3 to make an eight and survive, then proceeded to win most of the pots for more than an hour to run his stack well past 1 million and comfortably into the chiplead. Layne Flack, on the other hand, started six-handed play with the chiplead but could barely scrape together a pot as his stack dwindled. As he’d been doing regularly, Martin open-shoved when it folded around to him in the small blind and Flack called for his last 215,000. They both drew one, with Flack well ahead holding 8 7 6 2 against Martin’s J 6 5 3 . Martin paired his 3 , leaving Flack with plenty of outs to double, but the 8 was a disaster as it made a bigger pair and doomed Flack to a sixth place finish. After such a long string with no eliminations, the dam burst with Flack’s exit and a flurry of all ins from the remaining short stacks was the result. Lisandro blinded down to a single big blind, but doubled three times in four hands. Wedged in between was a big double-up for Baker, who patted with a nine-eight low while Turner patted a ten-eight low, putting Baker back above 500,000. This left Turner as the second shortest stack, and while he took down the blinds on his first all in Turner’s second consecutive all in met resistance from Puchkov. Turner shoved his last 164,000 in from the cutoff and Puchkov called on the button. Turner drew one card and Puchkov stood pat, tabling 8 7 6 5 3 to cause Turner to immediately stand up. He had been drawing to a ten-low and the card he drew didn’t matter, eliminating Turner in fifth. Lisandro’s comeback continued as he crested above 500,000, but he lost almost half of that back in a series of showdown. He then entered a pot with Baker where he’d try to double to his biggest point at the final table, one that would change the course of the rest of the tournament. Lisandro shoved for 253,000 in the small blind and Baker called in the big blind, putting more than a third of his chips at risk. Lisandro drew one and Baker stood pat, tabling T 8 6 3 2 . Lisandro was fairly live with 8 7 5 3 , needing a deuce, four, six or nine to survive. The 7 paired Lisandro, keeping Baker’s ten-low ahead and putting Lisandro’s comeback story to an end in fourth place. Martin took the chiplead into the dinner break, with over half the chips in play three-handed. Puchkov took a pot off of Baker immediately upon their return, but then managed to tangle with Martin in two pots that would derail his hopes of a second bracelet. After calling a raise from Martin in the big blind, Puchkov drew one and Martin drew two. Puchkov led out for 48,000 and Martin thought it over for a minute before calling with a jack-eight low, which had Puchkov’s ace-low beat. Puchkov opened to 62,000 in the small blind on the next hand and Martin put him all in from the big blind. Puchkov quickly called for just under 600,000 and stood pat, while Martin chose to draw one. Martin’s 9 7 5 4 was live against Puchkov’s made ten-seven low, and he quickly peeled a card with ‘no spots’ (ace, deuce or three), eventually revealing the 2 to make his nine-low and bust Puchkov in third. It would take just nine more hands for Martin to secure his first bracelet win. Here are the final table payouts for Event 43 of the 2013 World Series of Poker, $10,000 No Limit Deuce-to-Seven.